As a busy mom, I know just how tricky it can be to keep your home clean when you have little ones running around. In fact, from experience, I know that sometimes it can seem physically impossible. However, it doesn’t have to be that way; there are lots of simple ways you can make keeping on top of your cleaning easier. Keeping your home tidy doesn’t have to be difficult, by following a few simple rules, you can make cleaning much easier. I am convinced that steam mops were made for busy moms like me - they take all the hassle out of cleaning. Well, most of the hassle, anyway. You don’t need to worry about chemicals or carrying around a bucket of water, all you need is your mop, some water, and a plug point. If you are going to get a steam mop, I highly recommend investing in a six-in-one model. Instead of just being able to be used to clean the floors, six-in-one steam mops can be used to clean almost anything. They might cost a little more, but they are a great investment. We know that children make a mess, that’s just part of their charm. While we know that kids make a mess, it can be incredibly irritating when your furniture ends up stained and grubby. A sofa that is covered in stains isn't exactly, appealing is it? When it comes to furniture, most pieces are incredibly difficult to clean and need cleaning by hand or dry cleaning. This can make keeping your home cleaning even more difficult and time consuming, which is far from ideal. When it comes to choosing your furniture, you can either opt for furniture that has been made with a wipeable material. Or, you could opt for furniture that has removable slipcovers that can be taken off and easily washed. If you want a nice slipcovered sofa or chair, have a look at Nantuckit slipcovered furniture - there is a nice range on offer. Once your kids get to a certain age, it’s worth teaching them to clear up after themselves. Not only because this will help to make keeping your home clean, easier for you, but also as an important life lesson. 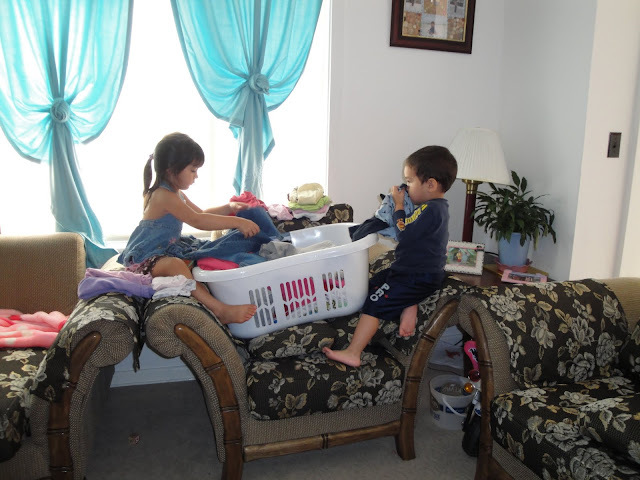 Did you know that kids that are taught to be tidy as children, tend to be tidier adults? Start off by asking your child to put their shoes and coat neatly after taking them off, and then move onto larger jobs. For instance, at the end of the day, ask your children to put their toys neatly away. Start off small and then gradually work up to giving your child more chores to do - use a chore chart for this. It can be hard to keep your home clean when you have young children to care for, but it’s not impossible. It might take a little longer to clean up than it used to, but it is doable. To make cleaning your home easier for yourself, make sure to take note of the tips mentioned in this guide. That scented vinegar bottle. Can you buy it like that? If so, where? Or do you make your own? If so, how? Hi Sandy, you can buy it through the link that can be found here.